Ross rolled up a fairly small force for the first round, with a herald to direct things. The attackers failed to seize initiative and the defenders let rip. The opening salvo was brutal, something like 20 Daemons were sent screaming back to the warp, but that didn’t stop them charging headlong at the defenders and summoning more allies. Turn 2 was just as effective from a defenders point of view – the Imperial firing was efficient and dropped the attackers to below 50% of their starting strength. We took a judgement on the scenario ‘rules’ at this point, and decided that the attacker should complete the turn before being banished (rather than suffering immediate banishment), but the Daemons failed to make any impression on the Imperials, and the round ended with no casualties among the defenders. We had a chat after the round and realised that we had forgotten to do any warp-storm rolls, so we did an ad lib roll for Nurgle’s Rot, and a few defenders were killed. Round 2: Ross rolled a larger force this time, with more beasts and elites than before, while the defenders stood pretty much unscathed from round 1. Again, the first round shooting was brutal, with the preferred enemy bubble provided by Kurov’s Aquila being particularly important for all the plasma gunnery that I had at my disposal. Orders meant that I could advance my plasma vets out of the village to gun down priority targets and then run them back in to cover, while the psychic phase allowed me to pull some dirty tricks here and there (like dominating a unit of horrors to prevent them from moving or casting, or reducing the invulnerable save on key units). The attacking turn was another rush-and-summon type affair, but the real kicker came as a result of the warp storm table… an 8 was rolled, and all my units had to roll a dice. A result of 6 meant D6 strength 6 hits… 666! My dice had been fairly hot up until this point, and continued to oblige with plenty of 6’s! I lost some 20 defenders, and being strength 6 meant that instant death was applied – not many of the casualties made it to the hospital, and suddenly the walls looked much more vulnerable. Fortunately, I had almost done enough damage to force banishment, and my second turn of shooting tipped it over the edge. The attackers did make the wall this time, but not in enough numbers to make an impact. Round 3: We had avoided night fighting so far, so turn 3 was automatically dark. Ross rolled well for the troops, and had a scattering of beasts and another herald I think. I had a couple of blokes discharged from the hospital, and I repositioned my reduced forces to cover gaps in the line and try and eliminate some of the defensive blind spots that Ross was beginning to map out and exploit. Veterans to the fore, I commenced firing, but my shooting was less than impressive this turn, I managed to completely miss with a demo charge (12” scatter! ), and even managed to drop mortar fire on my own position! I had a distinctly bad feeling… In the attacking turn a change of tactics became apparent. Rather than summoning more Daemons, everything that could cast ‘flickering fire’ did so, and the casualties started to mount up. The one exception was a summoned herald inside the perimeter. Fortunately, there was nothing unpleasant on the warp storm front, but several Daemonic units were poised for a second turn charge… My second turn saw me running some of my units to support squads that looked like they would be assaulted, and some sporadic firing got the Daemons closer to the 50% threshold, (including killing the herald that was summoned in), but not a great turn… I was really worried by this point, but the Daemonic turn was unbelievably unlucky. The psychic phase was really underwhelming for Ross, in fact, I don’t think anything was cast. 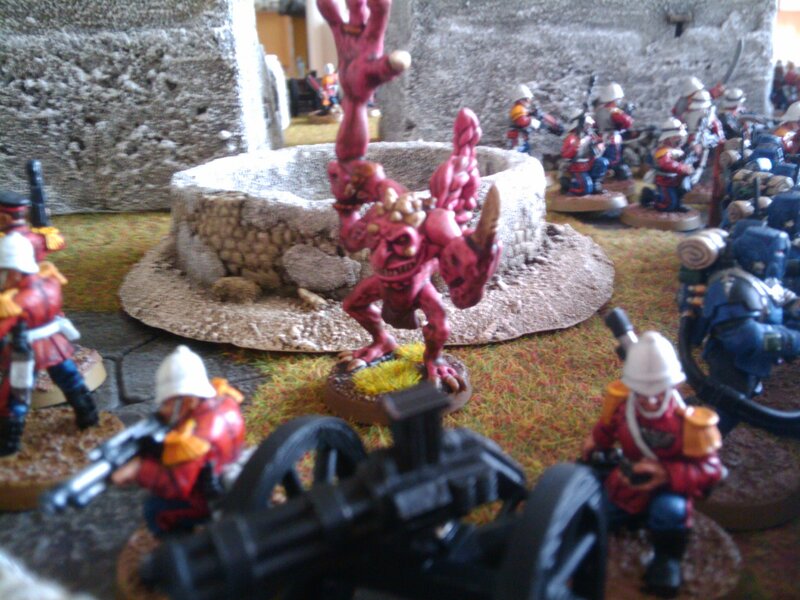 Overwatch fire was brutal and charges were failed, but some Daemons did get into combat. One spot in particular looked like it was going to be overrun, but the dice were fickle and the combat was close enough to the nexus for the Daemons to be weakened… although the Daemons won the combat, it wasn’t by a big margin and the defenders didn’t budge. The third turn saw some more Daemon casualties to firing, and the scrambling defenders joined the squad that was stuck in combat. This swung the result in my favour, winning the fight against the Daemons, (who were really struggling with the effects of the nexus), and forcing the instability check. The check was failed, casualties tipped over the 50% mark for the attackers, and the line was secured. The Daemons weren’t in a position to do anything during their turn so we called it and went to round four! Round 4: Ross had marked this as the final round, and he really went to town on the force generation! Crucially, he had a Greater Daemon this time, though fortunately for me, this was the only time I had needed to face one… I had some guys recover from wounds, but more died or stayed in hospital, so my forces were spread even more thinly along the walls. Some of my troops displaced from areas that were less threatened, and the remainder opened fire again with a really solid round of shooting, putting a good dent in the attacking numbers. It should be noted that I got very lucky in the random deployment stakes, with the Greater Daemon coming on right in front of my Autocannon HWS – a combination of orders and preferred enemy allowed them to put some 3 wounds on him before he had even moved! The Greater Daemon took to the air to avoid further fire (I had no sky fire), but did not want to risk flying within range of the nexus. The remainder of the horde surged forward, closing the gap remorselessly and trying to casting flickering fire where they could, but with little effect. The warp storm pulled another potentially nasty result for me, but I was truly lucky with my rolls and no harm was done. 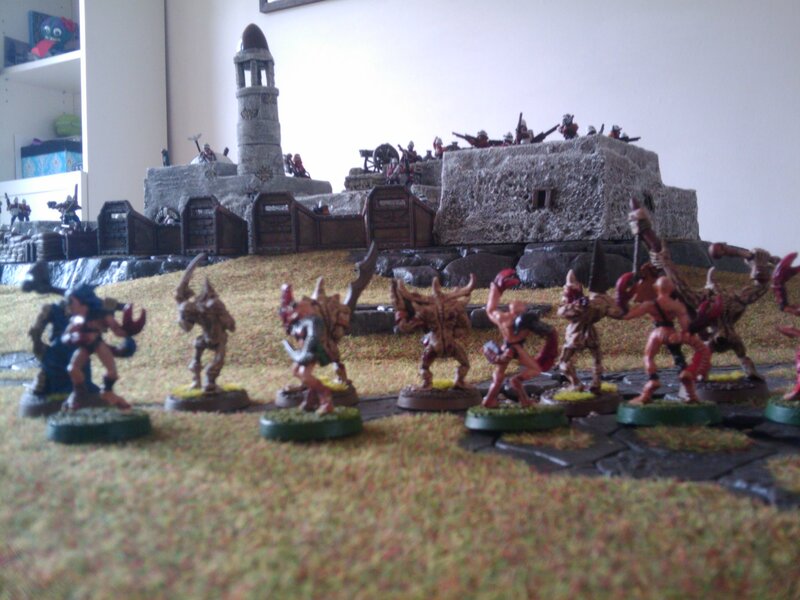 The second turn saw more of the same, the defenders smoothly executing their duties in the face of the ravening hoard, and the Daemonic casualties began to mount up. The attackers second turn was really scary – the Greater Daemon bounded into the village and went to town with flickering fire, wiping out the whole squad of melta vets in a single turn, and forming a breach that was quickly overrun with gibbering horrors. The weak point on the other side of the village was also assaulted in strength, resulting in more casualties among the defenders, but the line was held… just. The Imperial third turn was decisive – the desperate attack by the Greater Daemon had left it horribly exposed to return fire, and the plasma vets duly exacted revenge for their fallen comrades. 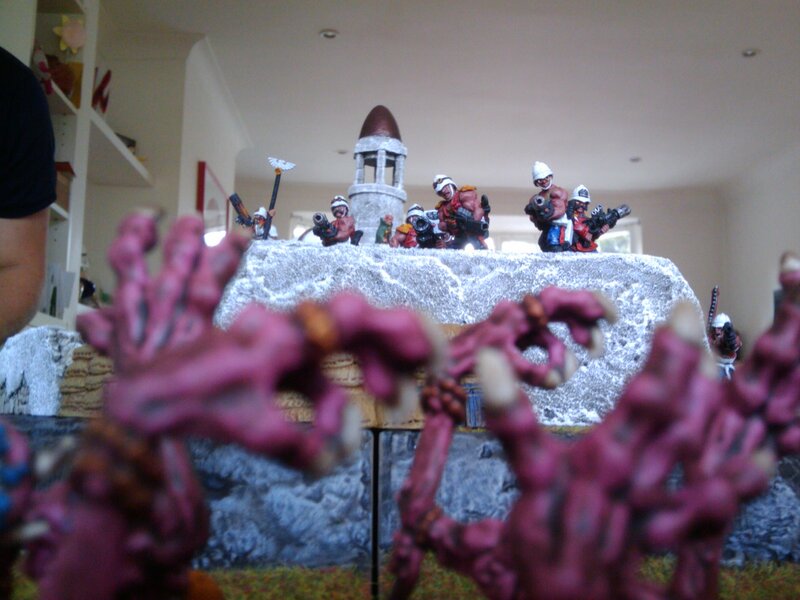 The beast was killed many times over and sent shrieking back to the warp, while the horrors that had managed to breach the line were quickly dispatched by the command squad. The other assault was joined by the troops that were pulled off the line elsewhere, and again, the weakening effects of the nexus enabled them to repulse the attacking wave…. We decided to call it quits at this point – the defenders had managed to hold out and the infernal forces of chaos were defeated… this time. The damage done by the Greater Daemon was horrific… If Ross had rolled more of these earlier in the game then it would have made a huge difference to the whole scenario… I was lucky! Warp storm – the biggest single source of casualties among the defenders… random, but scary! Kurov’s Aquila – worth every penny, especially in a gun line with plenty of plasma! Orders – Awesome force multiplier, with ‘Forwards for the Emperor’ (fire & run) being particularly useful throughout the game. Anyhow, here are some of my pics… they aren’t very good but hopefully Ross took some better ones that I can share with you at a later date. Hail brother! Great report; it really was a tense game in places, and what a great way to spend a Sunday! I’ve got a bunch more pictures that I’m going to post on my blog, and I’ll be sure to link people here for the full report!